Lincoln Park is truly one of Chicago’s most beautiful neighborhoods. Bordered on the east side by the park of the same name, and Lake Michigan, the close proximity to outdoor activities make this area popular with any active people. 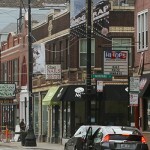 The feel of Lincoln Park skews to young adults, in part because of DePaul University and the students that live nearby. Many boutique shops, restaurants and bars line Clark Street and Armitage Avenue, which make for a great walking, lively urban culture, especially in the summertime. Lincoln Park is home to many gorgeous old single-family homes; brownstone and greystone walk-ups surround pretty tree-lined streets. Both renters and buyers will find opportunities here. Along Clark Street and closer to the lake, high-rise condominiums offer luxurious amenities and sweeping views of the lake and downtown. Lincoln Park is well served by Chicago’s CTA network: the busy brown, red, and purple lines of the ‘L’ pass through Lincoln park, giving residents easy access to downtown and northern neighborhoods including Wrigley Field. Bus access is also available, opening up every area of Chicago to those who live in this highly desirable area.